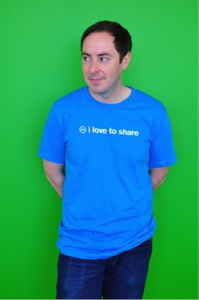 Timothy Vollmer, Public Policy Manager at Creative Commons, recently joined OASPA for a webinar to discuss Creative Commons licenses, resources, and current issues in open access publishing. Mark Patterson, Executive Director of eLife, chaired the discussion. Leyla Williams, Events and Communications Coordinator at OASPA, reflects on the discussion. Timothy opened the webinar by giving us an overview of the current state of Creative Commons (CC), who have been enabling knowledge sharing and re-use through their free copyright licenses since 2001. 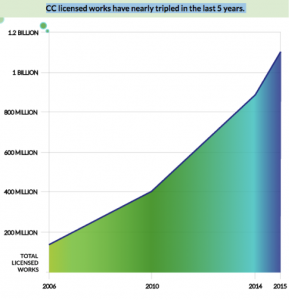 The number of CC-licensed works – online content that people can share, use, and remix – has tripled in the last five years. By last year, there were over one billion CC-licensed works in 34 languages, and these were viewed online over 136 billion times in 2015 alone. In short, Creative Commons has been growing exponentially. Image courtesy of Creative Commons State of the Commons report 2015, CC-BY 4.0. Timothy moved on to discuss OASPA’s bread and butter: open access. The Creative Commons attribution (CC-BY) license has become the gold standard for open-access publishing; it enables highly flexible sharing and reuse of content, and it has been built into the workflows and strategies of organisations all over the world. Timothy stressed that Creative Commons works have been used by those far beyond the walls of universities; articles published by The Public Library of Science (PLOS), for example, have been used by K-12 teachers in the United States in the classroom, and a bot has been created to harvest media from open access repositories like PubMed Central into Wikimedia Commons. So far, the Open Access Media Import Bot has uploaded 21,679 files to Wikimedia Commons; the code is reusably licensed and can be found on GitHub. Timothy Vollmer. Image courtesy of Creative Commons on Flickr, CC-BY 2.0. Next up was a discussion of further legal tools that could support open access publishing. Timothy cited author addenda – attachments to publishing agreements that enable authors to modify terms and publish open access – as an important resource. Creative Commons are also developing a ‘termination of transfer tool’ (see the beta version here) that allows authors to work out whether they can regain control of rights of their work that have been sold or licensed away. Moreover, ‘springing licenses’, in which authors grant their work to be made open access after ‘triggering events’ such as an embargo expiration, can enable open access implementation in the future. The move towards researchers being able to conduct computational analyses on texts and data, without restriction, is a key aspect of the vision for open access. Timothy pointed out that there are benefits to keeping copyright out of text and data mining; that the ‘right to read is right to mine’. This approach could open up text mining to all literature even before comprehensive open access is achieved. Organisations from libraries to the Open Knowledge Foundation have long been campaigning for text mining to be allowed for all content. The European Commission is considering steps to permit such mining, but only, as Timothy indicated, for ‘public interest research organisations… for scientific research purposes’. In counteracting the concerns that open access encourages plagiarism or affects an author’s moral rights, Timothy was keen to emphasise that open licenses do not replace citation ‘norms’ and best practices. Creative Commons licenses preserve moral rights, and their attribution requirements are intended to satisfy the ‘moral right of attribution.’ In fact, Creative Commons licensors may ‘request not to be attributed at all’. Having discussed various aspects of Creative Commons licensing and dispelling various myths about open licensing, Timothy rounded off by pointing out that Creative Commons are keen for collaboration and new ideas in the licensing realm. The benefits of Creative Commons licenses for OASPA members, publishers, those in higher education, and the general public are enormous, and Timothy’s passion and ability to speak accessibly about copyright issues is invaluable for connecting with wider audiences. On Wednesday, April 27, 2016, OASPA will host a live Twitter chat with Timothy about licensing from 3pm-4pm BST (UTC +1). Please join us for the hour by tweeting your questions about licensing, Creative Commons, and open access using the hashtag #OASPAChat, and Timothy will be there to answer them! If you missed the webinar with Timothy, the recording and slides from the webinar with Timothy, along with other past webinars, can be found here. Details of the next OASPA webinar will be announced on the OASPA website soon.